Tom Nechville creates many innovative yet highly functional instruments – too often, innovations aren’t really advancements, but that isn’t the case here. This spectactular flame maple and cocobolo example demonstrates the very highest levels of craftsmanship and concern for tone and functionality. As you pick up the Zeus, you’ll realize why Tom Nechville named this banjo after the king of gods. Players really seem to love the lighter weight of this banjo, as well as its smooth-feeling neck profile, radiused fingerboard and avante garde peghead profile. The beveled wooden armrest feels smooth on your forearm, the neck shape makes chording easier, providing clean, distinct and full bodied musical notes. 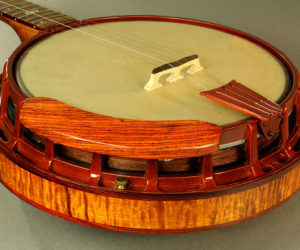 You hear a woody, penetrating clarity with none of the sonic interference that is ever present in other traditional banjos.